Facts and information about the History of Clothing and regalia of Native American Indians and their Turquoise Jewelry. The Native Americans of the Southwest including the Navaho, Zuni, Pueblo, Hopi and Apache tribes are famous for producing their beautiful silver and turquoise jewelry. Almost all of their turquoise jewelry is made with silver. 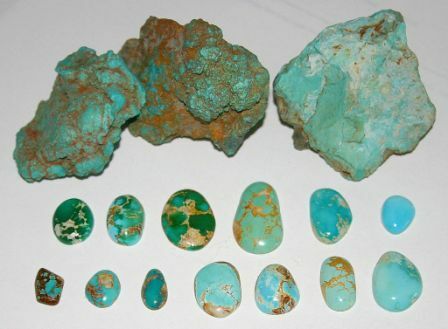 Turquoise is a semi-precious stone and is found in many U.S. states including Arizona, Nevada, New Mexico, Colorado, California, Virginia, and Utah. The Turquoise stone is considered by the Native American people to offer protection to the body and soul and as a symbol of purity. Turquoise Jewelry Fact 2: The Navajo tribe were the first to use turquoise, which was indigenous to the area they lived in and was quickly mined out. Turquoise Jewelry Fact 8: A famous myth surrounding the stone tells that Native Americans cried tears of joy when the rains came and seeped into Mother Earth to become "Sky Stone"
mineral with the chemical formula CuAl6(PO4)4(OH)8�5H2O. It is considered a semiprecious stone.